You walk through your door after a long, hard day. You’re tired, itching to put the kettle on, but instead you hear six, beautiful, little words. “Do you fancy a cuppa tea?” The sheer delight at hearing this, and even just thinking about it, fills me to the brim with warm fuzzy feelings. Valentine’s Day is around the corner, so whether you or a loved one is a tea aficionado or novice, there are many ways you can say ‘I love you’ with tea, and here’s some inspiration for you. Some of the best gifts I have ever received have not actually been physical presents. 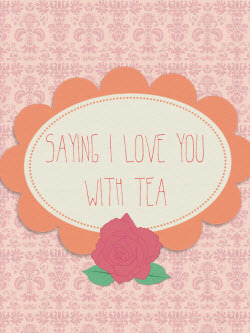 Giving your loved one IOU tea vouchers is a great ‘get of jail free’ tea making card for the future. I’d definitely appreciate receiving some for those times when you would like a cuppa tea to magically appear on your table! Use your imagination to make the vouchers really unique and personal for the person you’re giving them to. A wise person once said that a cup of tea is like a hug in a mug, which is even more reason to make sure you say ‘I love you’ with tea.